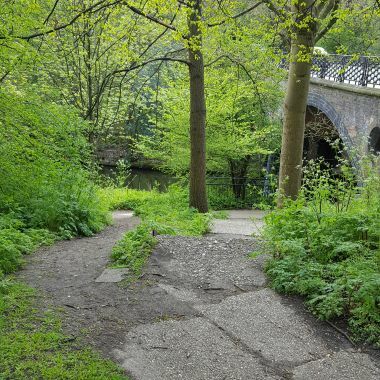 We are working closely with Canal & River Trust to propose a new ramp and stepped access at the junction of Prince Albert Road and Avenue Road in The Regent's Park to and from the Regent's Canal towpath, and we would like to know what you think. The project, funded by Transport for London, will provide improved access between Avenue Road and the Regent's Canal towpath, and improved connections to The Regent's Park and onward routes including ZSL London Zoo and Camden to the east and St Johns Wood, Lisson Grove and Lord's Cricket Ground to the west. Currently there are some rudimentary existing steps at this location (beside Macclesfield Bridge) which do not fully connect to the towpath level. It is proposed to remove these steps and replace them with a new ramp and steps which will connect the street level all the way down to the towpath. The design of the new access has been developed to take account of the existing environment, landscape and heritage features of the location, to limit the impact on the trees and vegetation and to take account of the access needs of our various visitors. View a map showing the location of the access (PDF 636.76 KB). The bottom of the new steps and ramp from towpath level (PDF 3829.08 KB). 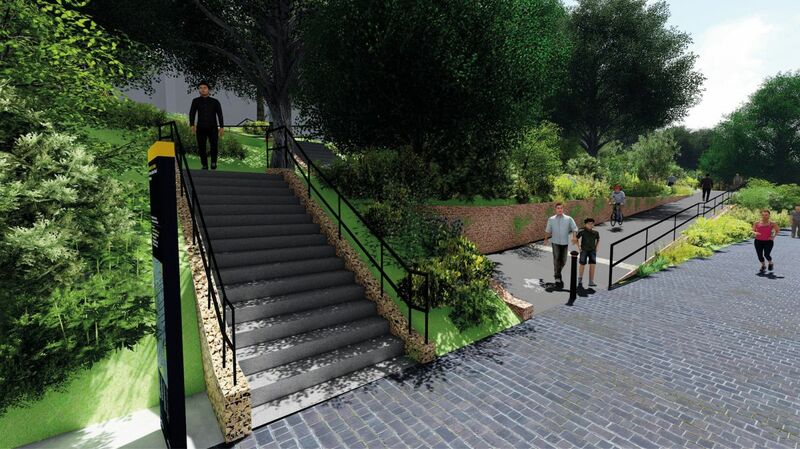 The ramp is proposed to provide a 3 metre wide sloped tactile surface with level landing points and hand rails. Whilst the physical constraints of the embankment have prevented an optimum gradient of 1 in 20 (5%) for all slopes of the ramp, the proposed ramp will have a gradient of between 1 in 15 (6.4%) and 1 in 12 (8.6%) on any individual slope section. The overall average gradient of the proposed ramp is 6.2% or 1 in 16. This will mean that we will be creating a slope that those using wheel chairs and prams will find far more accessible than the current substandard access. The project will also include new orientation and directional signs to locations of interest. To allow space for the new ramp and steps, although we have limited the removal of trees and other vegetation as much as possible, unfortunately we will need to remove a limited number of trees and shrubs. To compensate for this at least one replacement tree for each tree removed will be planted elsewhere within Regent’s Park and additional planting of the embankment is included as part of the proposals. No additional lighting is proposed. Visualisation of how the steps and ramp would look from towpath level - produced for Canal & River Trust by Arcadis Consulting (UK) Ltd.
We have been asking you what you think about the proposed new ramp and steps at Avenue Road, and our consultation on the plans is now closed. We have reviewed your responses - Thank you all for all your input. You can now read a brief summary of the results of the consultation in the following reports and appendices. Responses are being held by our project partner Canal & River Trust and if you have chosen to provide your contact details these may be shared with us only to keep you informed of the progress of the project from time to time and will be deleted following completion of the construction of the access, or at the end of the project, whichever is sooner. We have reviewed the feedback about our proposals for Avenue Road Access. We have now finalised our designs for the access and have submitted a planning application to Westminster City Council. You can view the application here: http://idoxpa.westminster.gov.uk/online-applications/ using application reference '18/06246/FULL'. If the proposal receives planning consent, we will then build the access between Winter 2018 and Spring 2019. The aim of the Mayor of London’s Healthy Streets Approach is to help create a vibrant, successful city where people can live active, healthy lives, through reducing car dependency and enabling a shift to more walking, cycling and public transport use. Active travel – walking more, cycling more, using public transport more – provides the easiest and most affordable way for us all to get more active and live healthier lives. It is also widely acknowledged that access to green and blue space benefits our mental health and well-being as well as our physical health. In addition to these health benefits, all the evidence shows that more active travel will reduce air and noise pollution, help combat social isolation, ease congestion, make us safer and bring economic benefits to businesses – large and small – across the Capital. Alongside delivering better signs across all 2,000 miles of towpaths, Canal & River Trust’s ‘Share the Space, Drop Your Pace’ behaviour campaign is now established nationally as a way to encourage good behaviour and respect for all when enjoying the waterways. The Avenue Road Access project is part of Canal & River Trust’s ongoing programme of towpath and access improvements across London and supports and is aligned with the Mayor’s Healthy Streets policy.